Media reported that the Election Commission (EC) recommended on Tuesday afternoon that the Thai Raksa Chart (TRC) Party be dissolved for allegedly drawing the monarchy into politics, but at 6pm the EC president told the Bangkok Post that the decision was yet to be finalised. Discussions will continue Wednesday on whether to punish TRC and if so, just how. The strongest punishment allowed by the EC is to recommend to the Constitutional Court that the party be dissolved. Earlier Tuesday, media reports said the EC had voted to ask the Constitutional Court to disband the party for committing an act deemed hostile to the system of constitutional monarchy by nominating Princess Ubolratana as its candidate for prime minister. The offence falls under the 2018 Political Parties Act, and the EC decision would be sent to the Constitutional Court. Princess Ubolratana issued her first comment on the controversy Tuesday night in an Instagram post. 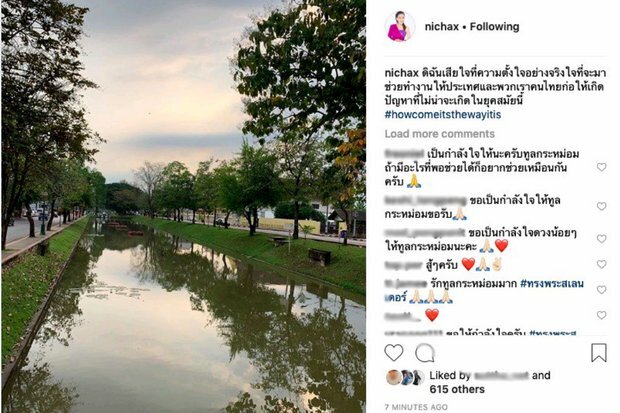 A one-sentence post by the Princess, whose online name is "nichax" said she was sorry that her intention to help the country had gone sideways. 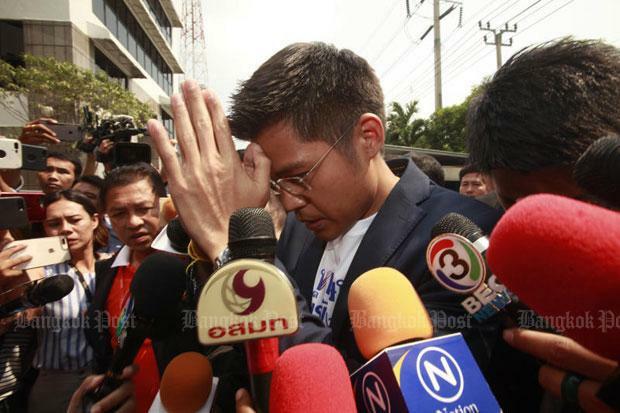 "I'm sorry that the sincere intention to work to help the country and our Thai people had caused problems that had seemed unlikely to occur in this day and age," read the post. It was followed by the hashtag, in English, #howcomeitsthewayitis. Princess Ubolratana made this post on her Instagram account at 11.35pm on Tuesday. The post included a peaceful photo of a klong, apparently taken in the countryside. Posted at 11.35 Tuesday night, Princess Ubolratana's comment quickly gained hundreds of likes and no immediate negative comments. Comments typically included both the wai and heart emojis indicating respect and love. The EC's discussions on the proper punishment for TRC were based on three pieces of evidence: the Feb 8 royal announcement, the party’s letter notifying the person it proposed as the prime ministerial candidate and the party’s letter allowing Parliament to consider approving its candidate as PM. If the court agreed with an EC decision to disband Thai Raksa Chart, its 13 executives would be barred from politics -- voting and running for elections -- either for 10 years or for life. Although the punishment would not apply to party candidates who are not executives, the party's dissolution would mean that none of its candidates can run in the upcoming election. The election law requires a candidate to belong to a party for at least 90 days before the election, leaving them with no time to switch. But if the court dissolves the party linked to fugitive premier Thaksin Shinawatra after the election, its MPs will have 30 days to apply to new parties. Thai Raksa Chart, perceived as a spin-off of the Pheu Thai Party, caused a political earthquake on Friday when it nominated Princess Ubolratana, the elder sister of King Maha Vajiralongkorn, as its sole candidate for prime minister after the election. The move was a serious blow to plans by Prime Minister Prayut Chan-o-cha and the Palang Pracharath Party to extend power via the March 24 election. The political gambit screeched to a halt on Friday night, however, when an announcement by the King was read on national television. His Majesty said that in spite of officially resigning her position in 1972, the princess was still a member of the royal family by tradition and is not allowed to take any political position. The dissolution of Thai Raksa Chart would leave the election strategy of Pheu Thai and other Thaksin-aligned parties in tatters. Thai Raksa Chart was planning to field 108 party-list candidates and run in 175 constituencies. Pheu Thai has apparently chosen not to field candidates in many of these constituencies to boost the chances of its perceived spinoff parties, including Thai Raksa Chart -- a strategic move that may now be seen as disastrous to its overall objective of preventing the continuation of military-backed rule.